for those passionate about cooking! What Part Of Lemongrass Do I Use? What Spices Go In A Masala Dabba? This is a common question that gets asked with nearly every Dabba bought. The simple answer is that there’s no fixed rule to what spices you keep in a masala dabba but a good guideline to selecting your spices is first taking a look at what dishes you most commonly prepare. For example if its a simple curry base then you can’t go wrong with turmeric, cumin, coriander etc, but individualise it to your own cooking preference i.e no need for chilli powder if you are a fan of milder dishes! 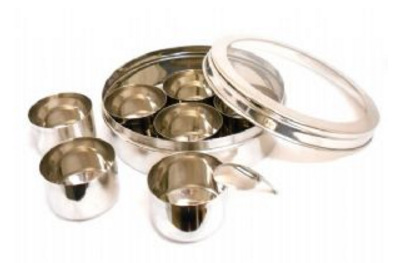 A common misconception about masala dabba is that they are used for simply spice storage. This of course is partly true, but masala dabba are traditionally used for more convenience and most indian kitchens will have more than just one. Each masala dabba will be filled with a set of spices specific to the cooking of a favourite dish, so it is ‘convenient’ – grabbing one tin full of what you need and not hunting around searching for packets or pots around the kitchen. 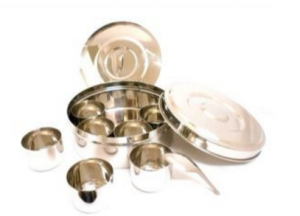 This is the reason you do not see huge masala dabba pots that will hold full packets of spices or masala dabba with individual lids as it would all combine in making it too bulky, heavy and impractical, losing the tradition of its original use to be quick and handy. You just have to keep it topped up and fill it with whatever spices you use most. I have many masala dabba at home with one I call my ‘Thai Dabba’, filled with just Thai spices for when I fancy a nice Thai Green Curry! And finally if your considering another masala dabba, take a look at these two we have available currently online. Follow Our Blog For All The Latest News, Offers, Product Reviews & FREE RECIPES! © 2019 theasiancookshop.co.uk. Theme: Ari by Elmastudio. Proudly powered by WordPress.